On 18th October 2013, the Worldwide Head of the Ahmadiyya Muslim Jama’at and Fifth Khalifah, Hazrat Mirza Masroor Ahmad (aa), officially opened the “Khilafat Centenary Hall,” built next to the Baitul Huda Mosque in Sydney, with the keynote address at an Inauguration Reception. “All distinguished guests – Assalamo Alaikum Wa Rahmatullahe Wa Barakatohu– peace and blessings of Allah be upon you all. First of all I would like to express my gratitude to all of the guests who have accepted our invitation and joined us here today. For you to accept the invitation of a religious organisation and to enter the mosque complex, despite not being associated to our religion, is a clear reflection of your open-heartedness and your very tolerant attitude. Your attendance is even more noteworthy given that in today’s world so much is written and spoken against Islam and a truly terrifying portrayal of certain so-called Muslims is being presented. It is a cause of regret that to some extent this fear amongst non-Muslims is justified, because some so-called Muslims have conducted the most horrific terrorist acts and killings, both in their countries and abroad. No doubt, they have created a state of fear, which is terrifying the non-Muslim world whilst at the same time defaming the pure name of Islam. In short, your attendance is proof of your enlightened minds and is a testimony to the fact that you wish to learn the real and true teachings of Islam. I am sure that many of you will have heard about the Ahmadiyya Muslim Jama’at from your friends or acquaintances and so will have some idea about what type of community we are. You would have just heard some of the speakers mentioning this as well. I am sure you will have heard that the Ahmadiyya Jama’at is a peace-loving community that acts entirely in accordance with the true teachings of Islam. It is a community that not only promotes peace, but whose every act and activity is conducted in an entirely peaceful manner. It is for these reasons that even those who are not well-acquainted with our community will have felt at ease joining us today. Nonetheless, there may remain some fears or misgivings in the hearts of a few of our guests. The truth is that it is almost impossible to entirely eradicate all doubts or fears from another person’s heart until a close relationship has been formed. I should at this point present a basic Islamic commandment which a Muslim must observe if he or she is to demonstrate high moral standards. Islam teaches that a Muslim must show gratitude and appreciation wherever it is due. In this regard, the Founder of Islam, the Holy Prophet Muhammad (s.a.) taught that a Muslim who does not profess thanks for an act of goodness or kindness is not grateful to God Almighty. With this in mind, a person who claims that Allah is the focal point and centre of his life could never tolerate remaining ungrateful to Him. Thus, gratitude is not merely a moral obligation or courtesy; it is actually a religious duty for a Muslim, because the basic objective for any true Muslim is to please God Almighty. It may well be the case that most secular people routinely express thanks to others, but they do so as a moral duty, because they are good people who live in a good society. It is not a religious duty for them. However, for a true Muslim offering thanks is a necessary element of Islam’s extremely intricate teachings that he must follow. Anyway, what I have said has formed quite a long introduction; however it was actually not just an introduction, but an explanation of one part of Islamic teachings. I shall now expand upon these teachings by explaining why the Ahmadiyya Community places so much emphasis on drawing mankind’s attention towards the highest moral standards and establishing peace. The fundamental reason is that the Founder of Islam, the Holy Prophet Muhammad (s.a.) prophesized that a time would come when the practice of Muslims would move far away from the original teachings of the religion. He said that this decline would continue for around one-thousand years at which time God Almighty would send a person as the Imam Mahdi (Guided One) and as the Promised Messiah. He would come to guide the Muslims towards the real and true teachings of Islam. “The second purpose is that for the sake of God’s people and out of compassion all persons should engage their strengths and capabilities in the service and well-wishing of God’s people. It is on the basis of these compassionate teachings that the Ahmadiyya Muslim Community makes every effort to spread love, kindness, brotherhood and peace to every corner of the world. Ahmadi Muslims can literally be described in just two lines – as those people who fulfill the rights owed to God and those who fulfill the rights owed to God’s Creation. Without acting upon these teachings a person cannot claim to be a true Ahmadi Muslim. If we reflect and consider, we will realise that these are the very virtues that today’s world stands in urgent need of. These are the principles which can become the means of establishing world peace. I say this because a relationship of love and sincerity can only be formed with God when a person fulfils the rights owed to Him and God’s rights can only be fulfilled when His commands are followed. This is the standard of justice that a person has the right to expect from others. Neither personal grievances, nor national enmities, should lead to injustice or unequal treatment. No matter the circumstances, fairness and impartiality must always prevail. In the verse I have just quoted, Allah says “adopt righteousness.” This means that if a person fulfils the rights of others by acting with true justice, then that deed will itself be classed an act of worship, because the underlying intention was to gain the pleasure of Allah. Therefore, the very highest standards for Muslims were established by Allah more than 1400 years ago so that an atmosphere of peace, love and affection could be fostered. If any Muslim does not adhere to these teachings it would be entirely wrong to blame the teachings, rather the fault would lie with the individual. I am sure the underlying reasons that motivate the Ahmadiyya Muslim Community to promote peace and brotherhood to such a great extent will have been made clear by what I have just explained. Similarly, there are countless other commandments given by the Holy Qur’an which underscore the importance of fulfilling the rights of mankind. For example, the name of the hall in which this reception is being held proclaims that whosoever enters it will attain nothing but peace and security. It also attests to the fact that those who have built it are they who spread peace and harmony in the world. 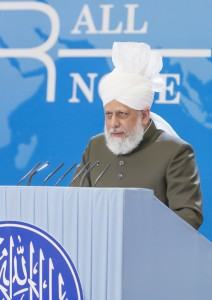 This hall has been named the “Khilafat Centenary Hall” and the word “Khilafat” means “Successor.” The task of any successor is to continue the mission and objective of the person whom he is following. The task of the Ahmadiyya Khilafat is to continue pursuing the peaceful objectives laid down by the Founder of the Ahmadiyya Community, which I have just outlined. And so, under the guidance of the Institution of Khilafat, the Ahmadiyya Muslim Community has continued this work for more than one hundred years. This hall was constructed to commemorate the successful completion of 100 years of the Ahmadiyya Khilafat. It was built with the aim that Ahmadis remain constantly reminded of the objectives and responsibilities entrusted to them, which they continue to fulfill under the guidance and leadership of the Khalifah of the Time. Upon learning how devoted and attached Ahmadi Muslims are to Khilafat, it is possible that a question may arise in the minds of some people. It may be that some people wonder, whether due to such devotion, the Khalifah could, God forbid, lead Ahmadis towards extremism or the use of force. To answer this, it should be clarified that the first part of the prophecy made by the Holy Prophet Muhammad (s.a.) was that after a long period of spiritual darkness lasting around one-thousand years, the Promised Messiah and Imam Mahdi would appear with teachings of peace, compassion and love. It is evident from the extracts of his teachings I have presented that the Promised Messiah came with exactly these objectives. And so as we believe that the first part of the prophecy has been fulfilled, then we must also, according to our beliefs, accept the truth of the second part of the prophecy, which was that following the Promised Messiah, his Khilafat would be permanent and would remain until the end of time. And his Khilafat would continuously draw mankind’s attention to fulfilling the rights owed to God and to His Creation. Rather than cause any threat or danger, the Khilafat of the Promised Messiah would only be a source of peace. About the true system of Khilafat, the Holy Qur’an has clearly said that it will be a means of transforming a state of fear and panic into a state of peace and security, so long as the people continued to remember God’s commands and follow the guidance of the Khalifah. Where on the one hand the Khilafat in Ahmadiyyat is a source of peace and tranquility for all Ahmadi Muslims, it can also be a source of peace and security for non-Ahmadis if they pay heed to what the Khalifah says. The history of the Ahmadiyya Community testifies to the fact that the Promised Messiah himself and all of his Successors emphasised the need to avoid wars and towards fulfilling the rights due to one another. The Promised Messiah himself proclaimed that he had come to bring an end to all forms of religious warfare. Furthermore, I have already mentioned how strongly he emphasised the fulfillment of the rights of one another. A society where religious wars have come to an end and where mankind’s attention is drawn towards serving humanity and fulfilling each other’s rights can only become a haven of peace. Certainly, this is exactly the type of society that the world stands in great need of today. All of the Khalifah who have led the Ahmadiyya Muslim Community have always advocated for peace, unity and a sense of mutual brotherhood. Let me give just a couple of examples. After the First World War, the Second Khalifah of our Community informed the world that without true justice, peace would not develop and the League of Nations would fail. Then, in 1990 when the situation in Iraq deteriorated, our Fourth Khalifah warned that not only would the Arab countries suffer but ultimately the peace of the entire world would be destroyed. Indeed, the world has since observed that both of these warnings proved entirely accurate and today conflict continues to plague the world. For the past four or five years I have been warning that the world stands in desperate need of peace. No one should assume that a war between any two countries will remain limited to just them or to a particular region; rather, ultimately it will culminate with a world war. Indeed, the state of the world today is clearly indicating that we are on the brink of an extremely dangerous global war. Such a war will include countries that possess nuclear weapons and whose leaders are trigger happy and do not care about the horrific consequences of their acts. As a result of their carefree attitudes, the world may come to witness a truly devastating destruction. Thus, I implore all relevant parties to come to their senses and act with wisdom. They should rise above their selfish ways and their personal interests. They must realise that such a war will harm not only today’s world, but will have a horrific impact on our future generations. Those amongst you who have an influence on the major powers of the world or who can convey this message to those who have access to the corridors of power, should urgently fulfill their responsibilities. Do not consider the problems and conflicts of today’s world to be minor or insignificant but instead strive your utmost and make every possible effort to establish peace. Perhaps some amongst you will not agree with my analysis. However, it is when a person believes that his own strengths, his intellect and those around him are all powerful that he walks on a path paved with danger. It is at that point where a person becomes blind to the existence of God and to His Power that Almighty God’s Decree sets into motion. Remember, man cannot escape the results of his actions and so will have to suffer the consequences of the cruelties and disorders he has perpetrated. Thus, I ask all of you once again, to raise your voices with justice against all forms of cruelty, corruption and disorder so that the world can be saved from destruction. According to Islam, the requirements of justice are fulfilled when a person acknowledges his mistakes and does not only value the interests of his friends or of his own policies, but instead gives preference to fulfilling the rights of all people. May Allah enable the world to understand this reality and be saved from any type of major destruction or calamity, Ameen. At the end I would also like to extend my sympathies through you, to the people affected by the outbreak of the bushfire in particular, and the people and government of this state and country in general. I pray that may Allah the Almighty save the people from any further loss and remove their hardships. Once again, I would like to thank all of you for taking the time and effort to join with us today.